German historian; astronomer; born at Lippstadt, Westphalia, 1541; died at Prague Aug. 25, 1613. After having acquired a fair knowledge of rabbinical literature at Bonn and Frankfort-on-the-Main, he went to Cracow, where he studied under Moses Isserles. Later he attended the lectures of the brothers Löwe ben Bezalel of Prague and of R. Sinai. They introduced philosophy, mathematics, and astronomy into the circle of their studies, and from them Gans received the impulse to devote himself to these branches of science. He lived for a time at Nordheim (where he studied Euclid), passed several years in his native city, and about 1564 settled at Prague. There he came into contact with Kepler and Tycho Brahe, and took part for three consecutive days in astronomical observations at the Prague observatory. He also carried on a scientific correspondence with Johann Müller (Regiomontanus), and was charged by Tycho Brahe with the translation of the Alphonsine Tables from Hebrew into German. Among Gans's works the most widely known is his history entitled "Ẓemaḥ Dawid," published first at Prague, in 1592. It is divided into two parts, the first containing the annals of Jewish history, the second those of general history. The author consulted for the second part of his work the writings of Spangenberg, Laurentius Faustus, Hubertus Holtzius, Georg Cassino, and Martin Borisk. 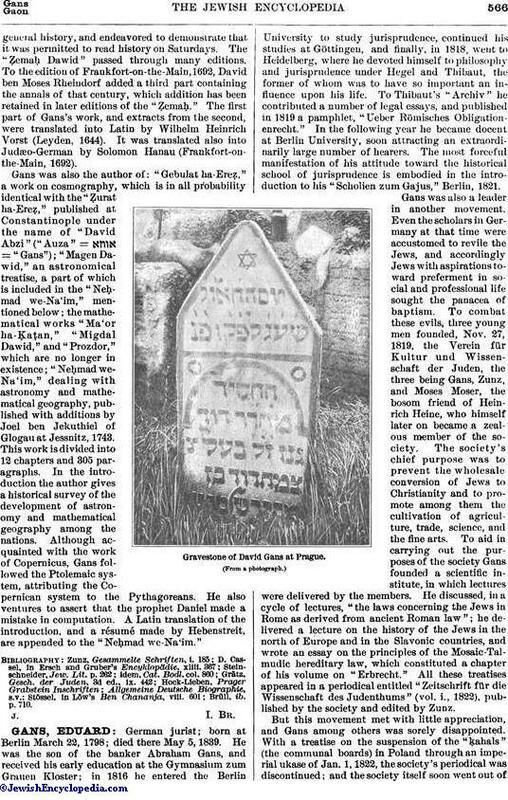 Though Gans's annals are very dry and have no great intrinsic value, they are memorable as the first work of this kind among the German Jews, who at that time appreciated historical knowledge but slightly. Indeed, in his preface to the second volume the author deemed it necessary to justify himself for having dealt with so profane a subject as the annals ofgeneral history, and endeavored to demonstrate that it was permitted to read history on Saturdays. The "Ẓemaḥ Dawid" passed through many editions. To the edition of Frankfort-on-the-Main, 1692, David ben Moses Rheindorf added a third part containing the annals of that century, which addition has been retained in later editions of the "Ẓemaḥ." The first part of Gans's work, and extracts from the second, were translated into Latin by Wilhelm Heinrich Vorst (Leyden, 1644). It was translated also into Judæo-German by Solomon Hanau (Frankfort-on-the-Main, 1692). Gans was also the author of: "Gebulat ha-Ereẓ," a work on cosmography, which is in all probability identical with the "Ẓurat ha-Ereẓ," published at Constantinople under the name of "David Abzi" ("Auza" = = "Gans"); "Magen Dawid," an astronomical treatise, a part of which is included in the "Neḥmad we-Na'im," mentioned below; the mathematical works "Ma'or ha-Ḳa?ṭan," "Migdal Dawid," and "Prozdor," which are no longer in existence; "Neḥmad we-Na'im," dealing with astronomy and mathematical geography, published with additions by Joel ben Jekuthiel of Glogau at Jessnitz, 1743. This work is divided into 12 chapters and 305 paragraphs. In the introduction the author gives a historical survey of the development of astronomy and mathematical geography among the nations. Although acquainted with the work of Copernicus, Gans followed the Ptolemaic system, attributing the Copernican system to the Pythagoreans. He also ventures to assert that the prophet Daniel made a mistake in computation. 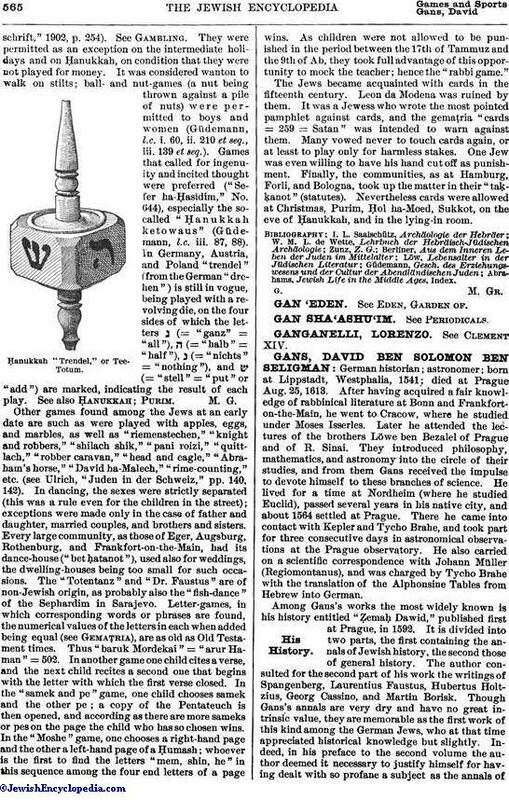 A Latin translation of the introduction, and a résumé made by Hebenstreit, are appended to the "Neḥmad we-Na'im."